Completely updated, the UK’s number 1 best-selling law book for non-lawyers will help you get to grips with UK and EU laws and regulations that impact modern sales and marketing practice. An indispensable book that’s written in non-legal jargon and language that’s easy to understand and follow. The second edition of the bestselling marketing law book helps to steer the reader through the legal minefield of EU and UK laws as well as providing unique strategies for using the law as a sales and marketing weapon in order to achieve competitive advantage. Making agreements; making statements in sales and marketing; legal barriers to market entry; legal requirement for sales and marketing activities; law as a weapon for competitive sales and marketing advantage; direct marketing and direct selling; EU Privacy and Electronic Communications Regulations; sales and price promotions; prize promotions and incentives and sponsorship and hospitality. All complex legal and regulatory principles have been made fully readable and comprehensible and the book doesn’t assume any previous legal knowledge, expertise or experience, making it an essential handbook for marketers at all levels. 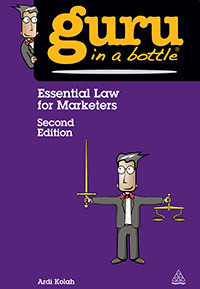 Essential Law for Marketers was Book of the Month (February/March 2013) for the Chartered Institute of Marketing.